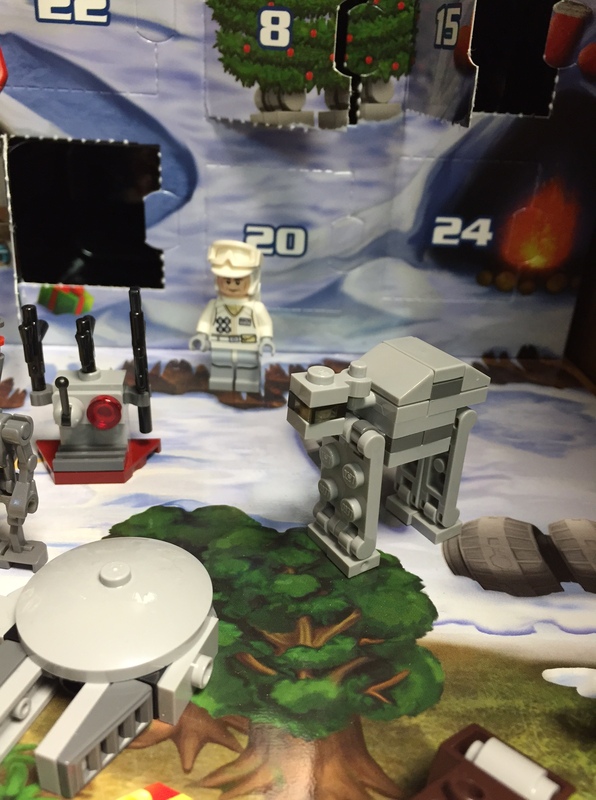 After taking a hiatus in 2014, I am blogging the LEGO Star Wars Advent Calendar again. This is my third time, and I thought it would be appropriate with the new Star Wars movie coming out later this month. Each day, I riff a little bit on a (perceived) connection between Advent and whatever the LEGO Star Wars mini build is for the day. This is meant to be lighthearted and fun. In a previous Star Wars Advent Calendar, I did a post on the AT-TE. Since today it is an AT-AT, I made some tweaks to the original post, and reposted below. Enjoy. AT-AT, or the All Terrian Armored Transport, is today’s build. The AT-AT first appeared in The Empire Strikes Back in glorious fashion, and were crucial to the Empire winning the Battle of Hoth. While they moved slowly, they could handle any kind of environment when in battle. From being a transport, to also carrying firepower, they were often deployed in a large scale to overwhelm their foe. Walking distances slowly, through any kind of environment, I’m reminded of the distances Joseph, Mary and the Magi covered with the Nativity. Joseph and Mary traveled the distance from Nazareth to Bethlehem. Roughly 80 miles in distance, this may not seem like much. However, Mary was almost ready to give birth while traveling in who knows what kind of conditions. Exposed. It was probably slow going. She wasn’t walking in all likelihood, probably riding by camel, and she probably feels horrible. Joseph may be walking. Either way, they fall behind all their fellow travelers who are on their way to Bethlehem to register. Both are probably fearful as they realize they baby could come any moment, far away from home. They press on. The Magi are looking to the stars and see something out of the ordinary. They travel from the East to find this new King. They travel for an extended time, pressing on after the star in the sky. At some point, all of them do not know what they will find. Joseph and Mary are stragglers, and the Magi are strangers in a strange land. Yet they keep traveling. Words associated with faith are “journey” and “pilgrimage”. If one is faithful, they will not stand still. They will move. They will walk ahead toward where they think they should be going, even if they can’t see the destination. For Joseph, Mary and the Magi, their journeys were probably arduous, and yet once they all encountered Jesus they probably didn’t see their journeys as difficult anymore. We all have different journeys/pilgrimages we walk in our lives. They can be difficult, perhaps painful, but if we don’t give up and stop we will be rewarded. The destination isn’t the only reward because usually we are formed into something better and stronger throughout the journey.